Phillies catcher Jorge Alfaro cannot hang onto the ball Aaron Judge slides past to score on a two-run single by Giancarlo Stanton during the eighth inning. 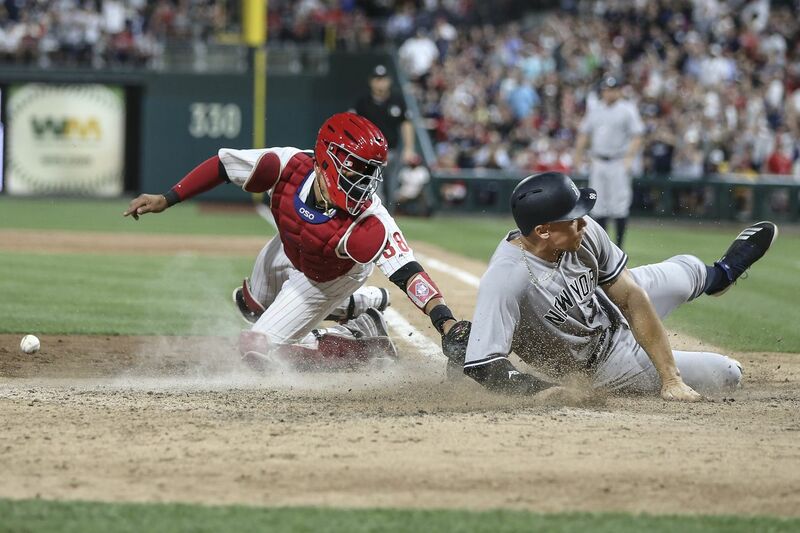 Yacksel Rios' red cleats — the ones that toed the mound at Citizens Bank Park — were definitely standing in South Philadelphia on Monday night as he readied to face Yankees slugger Giancarlo Stanton in the eighth inning. But Rios may have felt like he was standing in the heart of the Bronx after Stanton ripped a two-run single to seal a 4-2 Phillies' loss and turn Citizens Bank Park in Yankee Stadium South. It was hard to tell Monday who was the home team as Yankees fans flooded into South Philly. Everything the Yankees did — from Aaron Judge's screaming homer to Stanton's big hit to closer Aroldis Chapman jogging in from the bullpen — was met with thunderous cheers. The Phillies also didn't provide many reasons to applaud. They totaled just three hits after being held hitless until the sixth inning. Their rallies were quick to fizzle, they struck out 15 times, went 1 for 8 with runners in scoring position and Rhys Hoskins bickered with a fan. It was that type of night. Stanton's two-run double off Rios came after Adam Morgan failed to retire the three batters he faced and loaded the bases with no outs. Rios was thrown into the fire against one of baseball's premier hitters and the rookie righthander got burned. A three-run hole felt insurmountable on a night like Monday. Maikel Franco homered with two outs in the ninth but it was not enough. "We knew that there were fans here from New York," said manager Gabe Kapler, who said the energy in the ballpark was spectacular. "Obviously, the proximity between New York and Philadelphia suggests that's going to happen. But we really heard the power and the energy of ours." The Phillies put runners on second and third in the sixth but Hoskins struck out and Odubel Herrera grounded out to end the rally. Hoskins had a chance to reach first when his third strike skipped away from Yankees catcher Austin Romine. But Hoskins hesitated and failed to leave the batter's box fast enough. He returned to the dugout and chirped at a fan who was seated in the first row. Hoskins entered the dugout, removed his helmet, and walked back up the steps to say something else to the fan and gesture toward home plate, appearing to challenge the fan to go hit. Hoskins went 0 for 4 with two strikeouts. His frustration was evident. "I got caught up in the moment," Hoskins said. "It shouldn't happen. I can't let it happen. But it did. And that's how it goes." The Phillies broke through for a run in the seventh when Scott Kingery drove in Carlos Santana with a single to left. But that, too, ended quickly. Maikel Franco struck out and Jorge Alfaro then went down looking to end the inning. The extra buzz in the ballpark may have created the loudest crowd — home or away — for the Phillies this season. The 44,136 fans were the most to come to the ballpark for a game besides the home opener since Sept. 22, 2013. It was the Yankees' first regular-season visit to South Philly since 2006. And they were guided this time by manager Aaron Boone, who grew up in South Jersey while his father, Bob, played for the Phils. "I had some of the best times of my life growing up here," Boone said. "Getting to run around across the street at Veterans Stadium every single day. It was a great place to grow up, around some great teams and great players. We lived here year-round, as did a lot of the players. It really was like a family." Vince Velasquez struggled with his pitch count but he managed to do enough to keep the Phillies in the game. Velasquez struck out seven and allowed two runs on three hits with four walks. He threw 96 pitches and his 50th was thrown in the third inning. Judge lasered a home run off him in the fifth, but it was just a solo shot. Velasquez could live with that. And so could the Yankees fans, who became unglued, forcing you to remind yourself that you were still in Philly. "It was fun," Hoskins said. "Good atmosphere. We as players dream of that. Obviously, we like it to be swayed more our way. But that's the Yankees. The Yankees travel. They always do. They always will. No matter where they are. I've never been in a playoff baseball game but I imagine that's pretty close to what it feels like." Phillies lose to the Yankees, satisfying the Citizens Bank Park crowd. Jake Arrieta vs. Luis Severino tomorrow. Should be a good one.